Family and personal vacations are a big part of the summer months and no person expects to have damage to auto glass during a trip. Auto glass damage can and will happen when you least expect it. Traveling to secluded areas may not provide available phone service for you to rely on. PG Toluca Lake auto glass repair services offer 24/7 repairs. A repair request can be made online for a fast response. Personal cars and trucks are often used for traveling and so are RVs and campers. These luxurious homes away from home provide safety and comfort. A crack or damaged section of the windows requires repair to reduce safety threats. Specialists at PG auto glass repair in Toluca Lake know how to fix damage to any window and guarantee the work against defects for life. Severe damage to your auto glass that cannot be repaired with professional equipment must be replaced with the right type of glass. It may be lucrative and inexpensive for an inexperienced company to rely on aftermarket glass for installations, but this glass is never recommended for use. PG Toluca lake auto glass repair experts use manufacturer rated OE glass for every replacement to restore safety levels and protect innocent drivers from harm. Every motor vehicle is equipped with safety features like turn signals, brakes and seat belts to protect drivers from mistakes while driving. Many drivers frequently let small cracks and holes go without making a repair. PG auto glass repair in Toluca Lake specialists educate drivers about the importance of glass repair and respond quickly to every phone call that asks for repairs or emergency replacements. Emergency service for Toluca Lake auto glass replacement comes in handy for taxi drivers, airport shuttles and delivery companies that cannot afford to be without windows for legal transportation. Workers that work late shifts after standard businesses have closed need a reliable company to call when glass is broken. 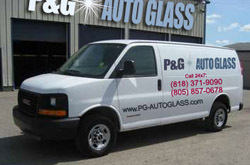 PG auto glass replacement in Toluca Lake sends experts directly to you 24/7 when glass damage happens. Do you need auto glass repair or replacement in Toluca Lake, CA in zip codes 91602 or 91610? Contact PG Auto Glass and get back on the road as soon as possible.